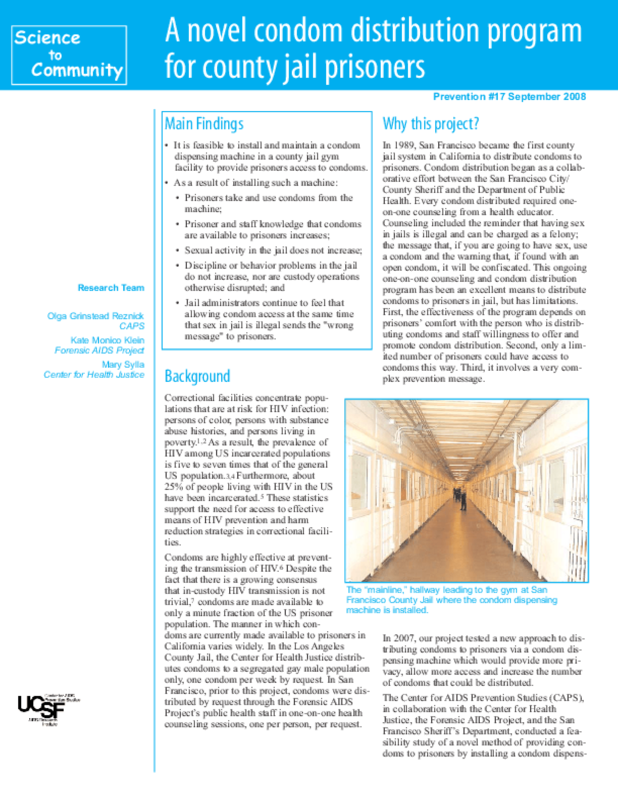 The Center for AIDS Prevention Studies (CAPS), in collaboration with the Center for Health Justice, the Forensic AIDS Project, and the San Francisco Sheriff's Department, conducted a feasibility study of a novel method of providing condoms to prisoners by installing a condom dispens- ing machine in the San Francisco County Jail. This study begins to address the dearth of research on prisoner condom access programs, a novel component of HIV prevention behavioral interventions among an extremely high-risk population, and to identify a method of providing prisoners condoms on a larger scale than any current program. Further, this pilot feasibility study has the potential to stimulate research on the impact of condom distribution and consideration of legislation in other jurisdictions to allow prisoners access to condoms. Copyright 2008 Center for AIDS Prevention Studies (CAPS), University of California, San Francisco. All rights reserved.